Donald Batisky uses the mobile app Pedia BP to assess patient James Robinson’s blood pressure. The Pedia BP app now features an auto-clear button to speed up data deletion between screenings, based on feedback from students. 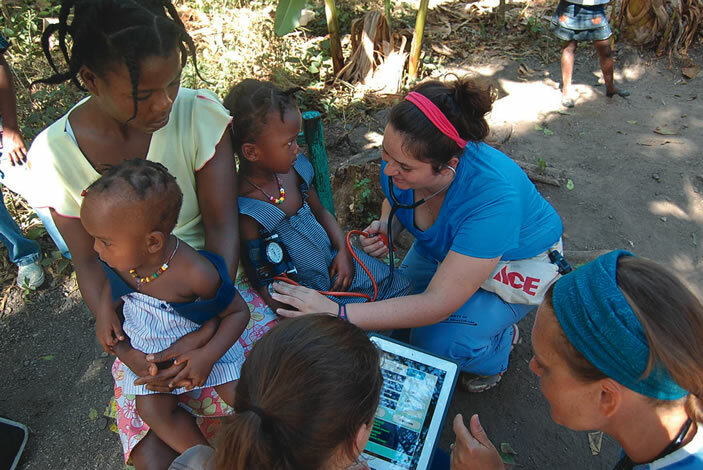 Nursing students conduct blood pressure screenings of children in Haiti and Moultrie, Georgia. The students helped pilot the Pedia BP app in both locations. Thus far, approximately 10,000 users have downloaded Pedia BP on their smartphones and tablets. Hope Bussenius 93MN DNP FPN-BC once took flying lessons in a single-engine plane, guided by the charts and maps that pilots then used for navigation. Now she would learn to fly using a global positioning system or GPS, the satellite-based device that simplifies navigation and enables pilots to focus on other cockpit tasks. Bussenius, an assistant clinical professor and a family nurse practitioner in the School of Nursing, has developed a free mobile app for clinicians based on a similar premise. Called Pedia BP, the app simplifies and speeds up the detection of hypertension in children and adolescents. 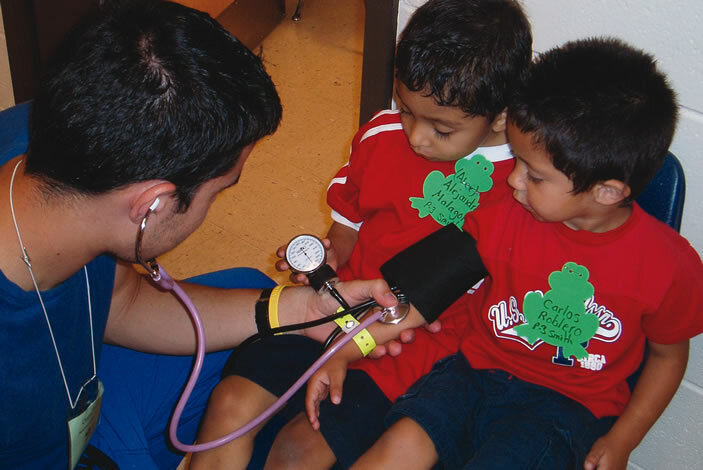 Typically, when nurses take a child's blood pressure, they consult a complex set of tables, developed by the National High Blood Pressure Education Program (NHBPEP) Working Group on Adolescents and Children and the Centers for Disease Control and Prevention (CDC), to determine hypertension risk. The tables require nurses to cross-reference multiple factors—including gender, age, and height—to determine in which of four percentile ranges—normal, prehypertensive, stage 1, or stage 2—a child falls for hypertension. On average, consulting the tables takes up 10 of the 15 minutes allotted for screening each child. Bussenius came up with the idea for Pedia BP while working on her doctor of nursing practice (DNP) under the guidance of Emory nephrologist Donald Batisky MD, director of the Pediatric Hypertension Program at Children's Healthcare of Atlanta. "He gave me this packet of tables and said, 'I want you to take a look at this to see if you can do anything with it,' " Bussenius recalls. "As I started reading through them, the complexity of the guidelines bothered me. I wondered if there was a way to simplify that model. I started thinking about a smartphone app, not knowing if it would work or not." To find out, she contacted a coding expert in California, who created Pedia BP within three weeks at a cost of $1,000. Bussenius began using the app in clinical practice in 2012. In a pilot study that summer, Emory nursing students used the app to screen more than 200 children during the annual Farm Worker Family Health Program in Moultrie, Georgia. "We found from our research that using Pedia BP saves two-thirds of time taking a pediatric blood pressure compared with using the traditional tables," says Bussenius, who co-wrote an article about their findings in the open access journal Translational Medicine in 2013. "It's easier to use, improves accuracy of results, simplifies the process, and saves time, which allows the provider to spend more time with the patient rather than combing through the 1,904 variables in the tables." 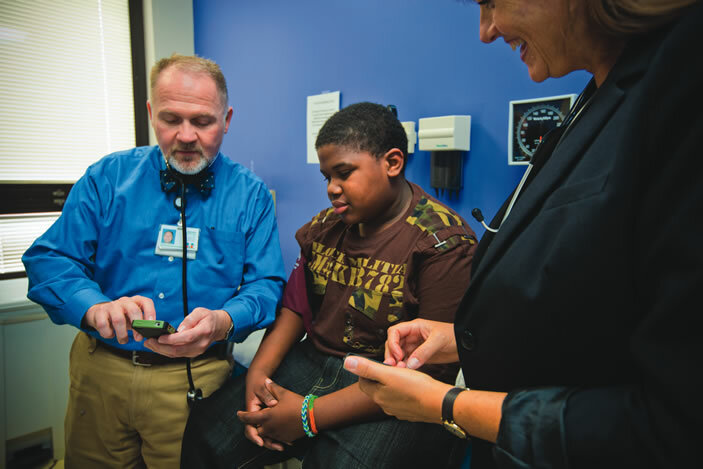 In addition to saving time, the app helps ensure that BP screenings are conducted accurately and provides immediate follow-up guidance for children who require monitoring or treatment. To demonstrate, Bussenius uses the Pedia BP app on her smartphone and enters the variables for a 10-year-old whose blood pressure is 120/84. "Some providers would not flag this as high blood pressure," she explains. "But when you pull all of the different variables together by using the app, you can see that the blood pressure reading falls in the percentile range for stage-1 hypertension. The app also recommends rechecking the child's blood pressure in one to two weeks."